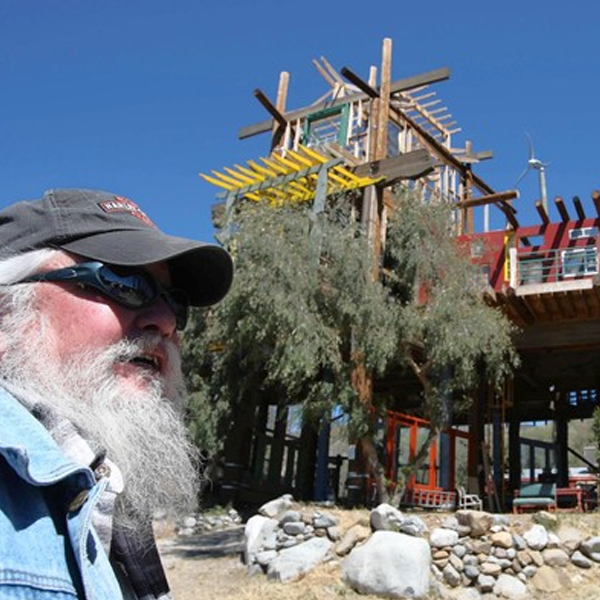 An Acton man already facing criminal penalties for building an elaborate structure called “Phonehenge West” without permits was found guilty Friday of additional building code violations; his creation is likely destined for the wrecking ball. But the Antelope Valley jury deadlocked on three other misdemeanor charges against Alan Kimble Fahey, who has been released on his own recognizance. The mixed verdict came three days after Fahey was found guilty of a majority of charges in the controversial case that has played out at the Lancaster courthouse since May 26. Fahey worked for about three decades on the massive, reddish cluster of structures until county officials ordered him to stop due to building-code violations. His case attracted international attention and support from fans who considered Phonehenge West a work of art, and who sympathized with his clashes with building inspectors. Fahey’s attorney, Jerry Lennon, said Friday that Fahey could pay fines as high as $500 for each of the 12 counts on which he was found guilty. He is likely to be required to do some community service, and would only be allowed to remain out of custody if he complies with the judge’s orders to immediately vacate the buildings that don’t have permits, Lennon said. Before his official sentencing, scheduled for July 8, Fahey has been ordered to consult with county officials to determine a plan for demolishing the unlawful structures, the defense attorney added. Deputy Dist. Atty. Patrick David Campbell argued during the trial that Fahey was a proud and talented artist, but also stubborn, and didn’t feel that code enforcement rules applied to him. Lennon defended Phonehenge West as an artistic creation. The defense attorney insisted that Fahey was aware of the safety issues and wanted to work with code enforcement officials, but that officials ignored him or were too disorganized to follow through. The jury deliberated six days and had so much difficulty reaching a complete verdict that attorneys at one point were ordered to re-argue certain portions of the case. Jurors twice reported that they were deadlocked on several charges, but Superior Court Judge Daviann L. Mitchell ordered the panel of eight men and six women, including two alternates, to deliberate further. Prosecutors are expected to announce later whether they will seek to retry Fahey on the three counts on which the jury deadlocked. Fahey has said he will appeal the verdicts against him.